I have been keeping hermit crabs for three years now, and started late summer of 2015 believe it or not. It’s been a really super long journey, learning uncountable information, and little tips along the way. 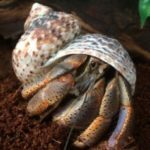 I have been on hermit crab websites before, but none seem to work out for me, so I tend to stay with my crabs in our solitude. Hermit crabs were always something I wanted, even before I knew how to care for them properly. I started with a ten gallon tank, then went to a 26 gallon tank, and finally converting all the way up to my current 55 gallon tank. Anyways, I will be on here, mostly to submit recipes, and stalk the forums.